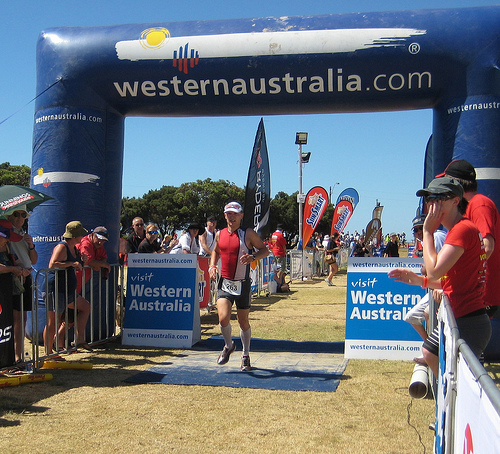 Ironman Western Australia – 9:20 Race Practice! 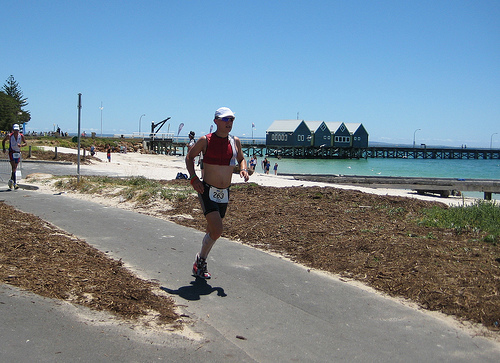 This is the race report, well one of the race reports as I have others promised too. If there’s one advantage to being sore and stiff post race it’s you can’t sleep in so end up getting on with things. As I’ll be putting more than one report online I want to try to keep them at least a little different. For this one I will focus on the execution of my plan with a few bits on what did and didn’t go well. It may be a bit sterile for it, but I promise more interesting stuff in other posts. This may not be too long as Tom was keen to have a report to read before his morning turbo! Hope this helps get you motivated. I look at the weather back home and can’t say I miss it. I have to confess that at times I didn’t stick to the plan as well as I should, there were a few little heart rate spikes in there for a start. However I focussed on executing what I set out to do and mostly delivered. It was a good job I’d put 10 minutes spare room into it as it turned out I needed it! But I don’t want to sound like I’m complaining about what was a great day for me and finished off a season on a high. My swim surprised me, I’ve got used to coming out of the water and finding I was just a little slower than I’d hoped. Yesterday things went right though. I didn’t place myself right on the front line, but near enough and managed to avoid getting boxed in like in some previous races. Whilst I did go out a little bit hard, I didn’t blow myself up in those first few minutes. People overtook me, but I got my rhythm and stuck with a group. Once a bit more space appeared I moved forward to other groups a little. The entire swim I benefited from a draft so things felt pretty easy. Not being able to check my watch and without having to work overly hard I really had no clue how I would do. Coming in under the hour was a great way to start the day. I’ll leave Laura to judge whether my transitions were up to standard or not. For me they were efficient, but I can’t claim to be fast. Got out onto the bike and immediately broke the heart rate rules I’d set myself! However I didn’t break them that badly and with one exception never spiked the heart rate above 150BPM. The first lap was fast, a result of 3 factors. I was working a little harder than I should have, the winds were low and I was part of a lead pace line. The pace line whilst mostly legal, definitely made a difference to effort. At 4 bike lengths you do gain a slight advantage and sheltering along with the psychological benefits. Unfortunately I got dropped off the rear at a turn-around and from then on I was on my own. I focussed on keeping that heart rate under control, whilst at the same time trying to keep a good pace. At the last minute I’d added average speed to my bike computer display so there was an added incentive to keep that higher. As the winds picked up working on your own got tougher and I regretted missing the pack more. Occasionally riders with disc wheels would come past me and I also regretted not owning one! I started to become paranoid about the sound of disc wheels hearing them coming up on me all the time! Though the guy playing maracas on the Highway was more irritating: I was on my own heard this rattling and before I spotted him was worrying about impending bike mechanicals! By the third lap the wind seemed a lot tougher than expected. I can’t say how much was fatigue and how much was really the wind. I kept pushing at the target heart rate and noted I’d switched to a big gear/low cadence approach. I have to admit I’m not much of a spinner really, and as longer races go on tend to switch more naturally to a larger gearing. I’ve seen debate about this online lately and at the moment will stick with the approach that seems to work for me. This wasn’t the time or place to experiment though. By about 150K of lonely, windy roads you just want things done. I got in under the 5 hour mark for the bike with plenty of room for transitions. Again things went smoothly and pretty efficiently, at least as well as they can if you use compression socks. I headed out onto the run feeling pretty good. Again I went out too fast, though it’s hard to be certain as I’m not convinced the distance markers were entirely accurate. Once I knew I was going too fast I was true to my word and slowed. I don’t think I held back enough at times and later down the line I paid a little for this. However the biggest contributor to my run issues was fuelling. If I come away from this race with any goal it’s refining my race food plan and coming up with something that works for me. With 8Km to go and having had a few stomach issues to I just ran low on energy. I pushed myself to the next aid station and walked it taking on as much as I could. When I started again I didn’t get very far and decided it was time to walk again. Fearing I’d end up sticking that way I allowed myself one minute. Then back to running and things started to click. As I got down to the last 5Km it was time to go for it and I lifted the pace. I pushed through to the end from here on in, hurting pretty hard. Checking my watch I knew 9:20 was on the cards it all came down to seconds here or there. So final big push in the last kilometre and I was home, 4th Ironman complete and a new PB! More to come later, they’ll be reports on both Tri247 and Jaggad in the next few days (once I’ve written them and sent them over!) I’ll put a more personal account of some of the events of the day up here a bit later too. Hope that helps you get fired up for the turbo Tom!